Till this day, there is not much known about the phylogeny of the Secale genus; therefore, in our research, we tried to shed some lights on the issue of rye (Secale genus) taxonomy. The genetic diversity and phylogenetic relationships were evaluated using 13,842 DArTseq™ polymorphic markers. The model-based clustering (STRUCTURE software) separated our 84 samples into three main clusters: perennial cluster, annual cluster, and S. sylvestre cluster. The same result was obtained using Neighbour Joining tree and self-organizing maps. Secale sylvestre, S. strictum, and S. cereale are the three main species of the Secale genus. Three samples of rye are in basal positions in phylogenetic trees. These accessions share ancient morphological characters and are probably the ancestors of different lineages within Secale. Annual Secale taxa, with the exception of S. sylvestre, create one mutual taxon. We have found out that the semi-perennial taxa of S. cereale var. multicaule and S. strictum subsp. ciliatoglume are genetically closest to the annual species of S. cereale. Phylogenetic signals for semi-perennial and annual taxa are also present in S. strictum subsp. africanum. 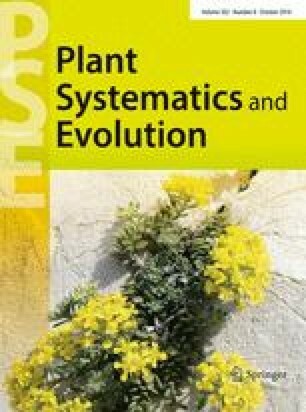 SNP-based analysis revealed that evolution of annual S. cereale has already begun in S. strictum subsp. africanum. The results showed that S. vavilovii cannot be considered as a separate species but a subspecies of S. cereale Secale cereale subsp. dighoricum is a hybrid. It is still not clear whether we can consider S. strictum subsp. strictum and S. strictum subsp. kuprijanovii as two separate species. The online version of this article (doi: 10.1007/s00606-016-1318-2) contains supplementary material, which is available to authorized users. This paper was supported by the Slovak Research and Development Agency under the Contracts No. APVV-0197-10 and No. APVV-0661-10. Online Resource 1. List of used accessions with place of origin and gene bank name. Online Resource 2. Estimating Maximum Likelihood (lnL) and hybrid index (h) for the hybrid accessions, their presumed and potential parents, using FAMD program. Online Resource 3. Super network phylogram of Secale genus accessions generated using Splits Tree software. Online Resource 4. The U matrix for the variables (i.e., 59 Secale accessions). Online Resource 5. Photo of tillering plants of MON1, and MON3 accessions. Online Resource 6. Maximum likelihood phylogram of Secale genus accessions generated using SNPhylo software from SNPs data with 500 bootstraps.